(CBS News) NEW YORK - Facebook's top executives have hit the road to drum up interest in what could be the largest Internet initial public offering (IPO) in history. Facebook co-founder and chief executive officer Mark Zuckerberg, chief financial officer David Ebersman and chief operating officer Sheryl Sandberg met with investors at the Sheraton Hotel in Manhattan Monday. About 50 bankers and 550 investors were in attendance, reports ZDNET. The meeting was closed to the press. 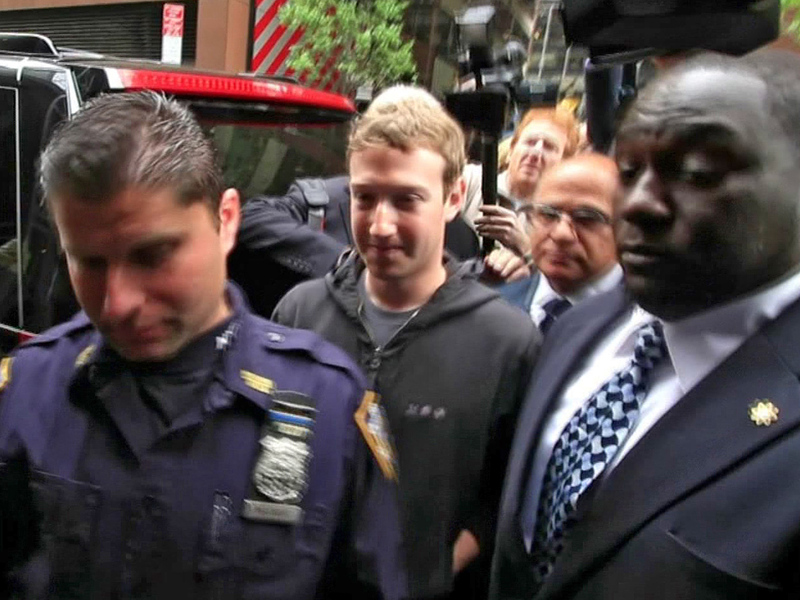 Zuckerberg arrived at the Sheraton just before 1 p.m. ET. Facebook executives spent 25 minutes answering questions, including how Facebook will monetize its mobile presence and whether or not there will be more splashy acquisitions, CNNMoney reports. The company made headlines when it bought mobile photo-sharing app Instagram for $1 billion. Facebook buys Instagram, now what? The executive team that heads the world's largest social network is working to create buzz ahead of Facebook's IPO, which has been estimated to be from $85 billion to $95 billion. The Menlo Park, Calif.-based company amended their S-1 filing last week to reveal that stock in the company will range between $28 and $35 per share. Facebook hopes to sell 337.4 million shares and could raise up to $13.6 billion, making it the largest Internet IPO of all time. The company is expected to set the price on May 17 and go public on May 18. Facebook reports 901 million monthly active users, 300 million photos uploaded per day and 125 billion friendships. An estimated 488 million people access Facebook via mobile products. Facebook filed for its IPO on February 1, with Morgan Stanley as its lead underwriter. The social network will trade on the NASDAQ under the ticker symbol FB.